Carbon fiber from an F-18 Hornet could make your car fly faster. The auto industry uses a lot of recycled materials. Scrap steel and aluminum get melted down and made into body parts. Old water bottles are turned into plastic components. Now add another source of recycled materials: decommissioned jet fighters. If initial tests prove positive, carbon fiber used to make high-strength, lightweight wings could be chopped up into short strands. The reclaimed carbon fiber could then be used to form reinforcing ribs for lightweight plastic parts in cars. The volumes needed aren't huge: just 1- or 2-inch additions here and there to strengthen plastic parts. Still, recycled carbon fiber couldn't be put to use until there was a sufficient volume of the material available. The aging of the jet fleet has finally made that possible. Carbon fiber was used in military jets starting in the 1970s and became common in the 1980s. 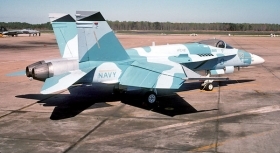 The F-18 Hornet, a mainstay of the 1980s, used a large amount of carbon fiber in its wings. The old planes make for a "good supply stream" of recycled carbon fiber, or at least enough to be a viable alternative to virgin carbon fiber, says Wayne Waller, director of engineering at IAC Group North America's pre-production and validation center near Detroit. "It's aerospace grade but can't be reused in that industry." It's too soon to know what the price of the recycled material will be. Industrial-grade new carbon fiber costs about $10 a pound; aerospace-grade carbon fiber goes for roughly $25 a pound. IAC is still testing parts with reclaimed carbon fiber. If the tests work out, prices should drop as demand rises.